This petition calls for the full restitution by the State of France of funds it extorted from the Republic of Haiti at gun point starting in 1825. On April 7, 2003, the value of the infamous Charles X ransom was estimated at $22 billion by Haitian President Jean-Bertrand Aristide who demanded its restitution. This demand is an initial measure of economic justice and respect for Haiti's territorial sovereignty and revolutionary legacy. Within the first weeks of 1804, Dessalines published a proclamation, offering to the captains of American vessels the sum of forty dollars for each individual native or black man of colour, whom they should convey back to Hayti. Art. 1. The people inhabiting the island formerly called St. Domingo, hereby agree to form themselves into a free state sovereign and independent of any other power in the universe, under the name of empire of Hayti. Art.2. Slavery is forever abolished. In 1825, French ruler Charles X offered to recognize Haiti's independence on the condition that the new Black Republic pays 150 million gold francs in ransom. The extorted bounty was distributed to white slave holders for the loss of “property” they claim to have suffered as a result of the abolitionist Haitian Revolution. This illegal and barbaric ransom was collected from 1825 to 1947. It was collected by violent means with an official ordinance of the French State which threatened to re-enslave the self-liberated Africans. 1853: French Admiral Duquesne threatens to bombard Port-au-Prince to restart payments on the French ransom which had been stopped in 1852 by Haitian Emperor Faustin Soulouque. March 1877: French gun-boat aggression against Haiti. At issue: resumption of payments on the 1825 ransom - balance then re-estimated at 20 million gold Francs. See: Papers of William Conrad Schutte (1737-1806), a Haitian planter who emigrated to Portsmouth, Va., ca.1793, including Schutte's bills, accounts, deeds, miscellaneous legal papers, and correspondence in Haiti, 1769-1789; and papers, 1825-1832, of Schutte's widow, chiefly concerning her attempt to secure compensation from France for property losses in the Haitian revolt in the 1790s. On April 7, 2003, the value of the infamous Charles X ransom was estimated at $22 Billion by Haitian President Jean-Bertrand Aristide who demanded its restitution. March-May 2015: A delegation of Haitian children (descendants of abolitionist leader Jean-Jacques Dessalines) from all corners of the island await French President François Hollande as he prepares to set foot in Haiti, on May 12, 2015. Their demand is clear and simple: TIME TO RETURN TO US OUR STOLEN BREAST MILK! CRIME is a group of American, Canadian and French activists who have taken credit for a July 14 Yes Men-style hoax announcement that Paris would pay $21 billion of restitution to Haiti for money extorted from the former French colony following Haitian independence. France24 (TV) covers Nicolas Sarkozy's historic visit to Haiti on Feb17 2010. Guests include Olivette Otele and Jafrikayiti (Jean Saint-Vil) discussing the thorny issue of the Charles X Ransom - over 90 million Gold Francs (Est. 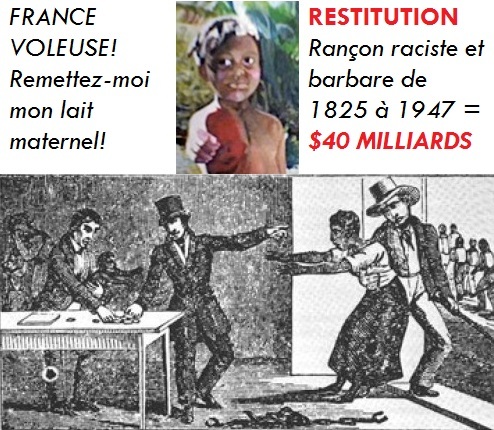 current value $40 Billion U.S) collected at gunpoint by various French governments from the Haitian state, between 1825 and 1947. Text and Video link of the plea made on CTV (National Television) to the Governor General of Canada, Michaelle Jean, native of Haiti and former citizen of France. A network of lawyers, scholars, journalists, concerned individuals and grassroots organizations and activists, dedicated to institutionalizing the rule of law and protecting the civil and cultural rights of Haitians at home and abroad.